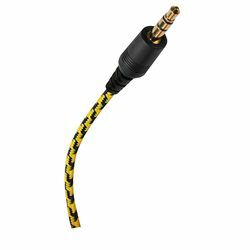 The STANLEY Braided Audio Cable is a great for drivers whose car stereos don't play wireless audio. The audio cable connects your phone or other multimedia devices to your car stereo so you can play your favorite music through your car's speakers. The 6 foot cable provides an extra-long reach for passengers in the rear seat. DURABLE NYLON BRAID - The rugged triple weave nylon-wrapped braid resists scuffs, tangles, and pinches. UNIVERSAL COMPATIBILITY - Connect any audio device, phone, tablet, laptop, iPod and more to a 3.5mm aux port for premium quality sound. EXTRA-LONG REACH - The 6 foot cable spans great distances, ideal for sharing music from the back seat of a car.